NEW! BURNMASTER® WOOD BURNING PEN & 10-TIPS. The exclusive Burnmaster® brand wood burning pen features a unique, exclusive, patent pending design, so advanced its incomparable! Note !!!!!! - This sale is for one only Burnmaster Pen and ten tips, this handpiece needs to be plugged into a lead and pyrography machine (unit) so that the tips heat. Adaption’s undertaken to fit handpiece to a non compatible machine at buyer’s risk and not covered under warranty. 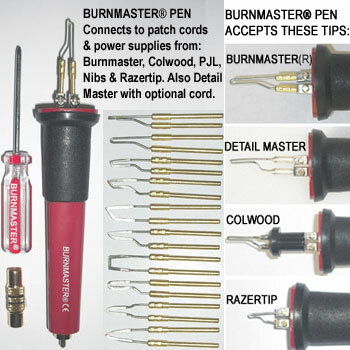 The Burnmaster® Pen is the first & only to accept replaceable tips & power from all major brands of "hot wire" wood burning systems. 2. It connects directly to these brands of power supplies & pen patch cords: Burnmaster®, Colwood, PJL (Optima), Nibs & Razertip (adapter included). *For Detail Master brand power supply connection order optional #499000 pen patch cord (listed separately). 3. Adjustable tip extension for deep reach, user comfort & control (Burnmaster & Detail Master tips only). Click the button below to add the (C) NEW! BURNMASTER PEN & 10 TIPS to your wish list.